This paper will introduce an innovative system for offline inspection and analysis of plastic pellets. It is either suitable for testing pellets that had been sorted out by an online inspection and sorting system, for sample testing of produced pellets or for incoming goods inspection. Until now there had been systems used for plastics inspection that either examine the surface of the pellets by optical technologies or that inspect an extruded tape/film for contamination. The system introduced in the paper is based on X-ray technology and is in particular focused on the detection of metal contamination, but also on the detection of e.g. agglomerates. It can be used for non-transparent pellets, such as semi-conductive material, colored masterbatches, etc..
At every inspection there are about 3,000 pellets placed in one layer on an inspection tray. 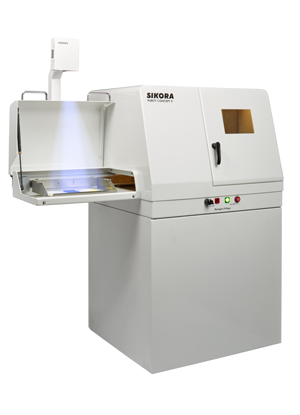 The pellets are X-rayed and the device, in combination with a processor system, provides statistical information on the quality of the material. Contaminated pellets are highlighted by a beamer on the tray and can be isolated for further analysis. The system is alternatively available with optical or infrared cameras depending on the types of contamination that have to be detected. In our paper we will at first give an overview about the technologies for offline inspection and analysis of plastic materials that are available on the market by outlining their advantages and limits. In the main part of the paper we will present the novel X-ray based system by explaining the functional principle and giving examples of typical detected contamination. Finally, we will discuss the advantages of such a system in terms of quality assurance, process optimization and cost saving for plastic manufacturers and processors.